Giving a major boost to Namami Gange Programme Union Minister of Water Resources, River Development and Ganga Rejuvenation Uma Bharti has launched 231 projects at over 103 locations in Uttrakhand, UP, Bihar, Jharkhand, West Bengal, Haryana and Delhi for cleaning of river Ganga and its tributaries from Gangotri to Howrah. All 231 projects launched by the government are aimed at reducing pollution and ensuring rejuvenation of the river Ganga. At the same time the idea behind the projects is also to maintain minimum ecological flows in the river Ganga with the aim of ensuring water quality and environmentally sustainable development. What is proposed under Namami Gange programme ? Uniform standards for both MoUD scheme and Namami Gange programme, 10 years mandatory O&M by the same service provider at par with NGRBA programme and PPP, Mandatory reuse of treated water. Expanding coverage of sewerage infrastructure in 118 urban habitations on banks of Ganga- estimated cost by MoUD is Rs 51000 Crores. Mo DWS scheme for all Ganga bank Gram Panchayts (1632) free from open defecation by 2022, at a cost of Rs 1700 Crores as central share. Rationalized water tariff to encourage reuse. Enforcing River Regulatory Zones on Ganga Banks. Rational agricultural practices, efficient irrigation methods. (v) Ensuring ecological rejuvenation by conservation of aquatic life and biodiversity. (vi) Promotion of Tourism and Shipping in a rational and sustainable manner. (vii) Knowledge Management on Ganga through Ganga Knowledge Centre. Scheme for rehabilitation and up-gradation of existing STPs along Ganga. Ensuring 100% sewerage infrastructure in identified town alongside Ganga. In situ sewage treatment in open drains. Support for preparation of DPRs. River Front Management for Ghat’s developments in selected cities and towns. Industrial pollution abatement at Kanpur on priority. Action Plan for Char Dham Yatra –Public amenities, waste disposal and sanitation. Capacity building of urban local bodies. Afforestation – Conservation of Flora. Conservation of Aquatic life – special attention on Dolphin, Turtles and Ghariyals etc. Disposal of flowers and other puja material. GIS data and Spatial Analysis for Ganga basin. Study of communities depending on Ganga for their traditional livelihood. National Ganga Monitoring Centre . Special guidelines for sand mining in Ganga. Assessment of Special Properties of Ganga Water. Communication and Public Outreach Activities. Eight biodiversity centers will be developed along Ganga for restoration of identified priority species. These centers will be developed at Rishikesh, Dehradun, Narora, Allahabad, Varanasi, Bhagalpur, Sahibganj and Barraackpore. 400 villages along the river Ganga will be developed as Ganga Gram in phase-I. 13 IITs have adopted five villages each for development as Ganga Grams. The training for 328 sarpanchs was completed at Sichawal in Punjab. A number of initiatives have been undertaken to clean the river according to a report in the last three decades, around Rs 40,000 crore has been spent on cleaning and conserving the river but failed to deliver desired results due to corruption, lack of technical expertise, poor environmental planning, and lack of support from religious authorities. Conservation and improvement of the Ganga was one of the main agenda of PM Narendra Modi so keeping his promise Narendra Modi announced Namami Ganga project in July 2014 budget for which Rs. 2,037 crores was set aside. In addition a sum of Rs. 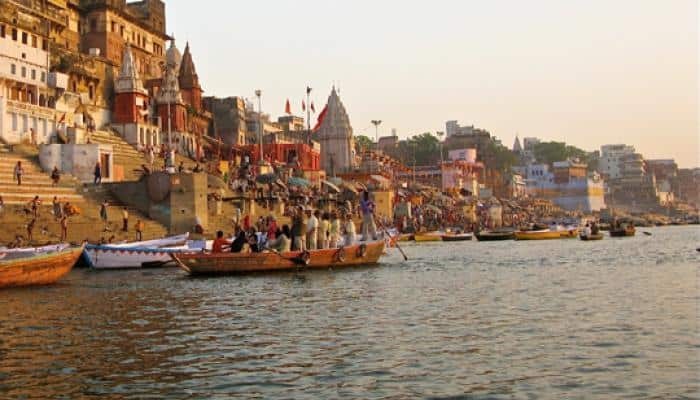 100 crores has been allocated for developments of Ghats and beautification of River Fronts at Kedarnath, Haridwar, Kanpur, Varanasi, Allahabad, Patna and Delhi in the current financial year. Namami Gange Programme is an ambitious integrated Ganga Conservation Mission that was launched by Prime Minister Narendra Modi in May 2015. The programme integrates the efforts to clean and protect the Ganga River in a comprehensive manner.